Making a Valentines Paper Craft Wreath with beautiful, red paper roses will give you the opportunity to decorate in a stylish way for not only Valentine’s Day, but really all year long. It is a little bit time consuming to make because of the many paper roses you will need to prepare, but for such an amazing wreath it is definitely worth the effort. Read on to learn how. The first thing you will need to do is to prepare a lot of paper roses. 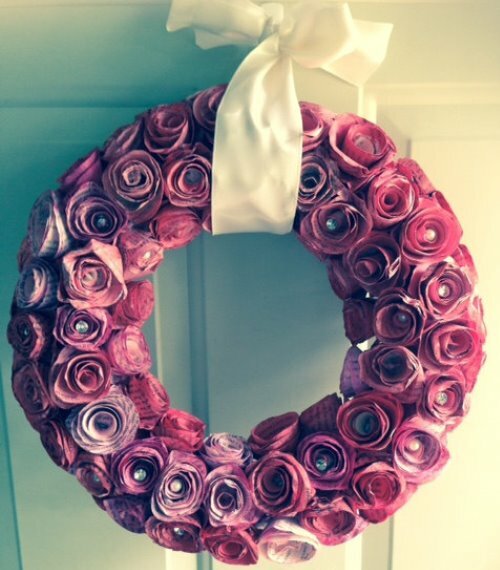 The amount of roses you will need depends on the size of the wreath form you have chosen. To make paper roses you will need to cut out circles from your cardstock paper. Each circle will give you one rose. You can freehand draw circles and cut them out, or use a circle template. After cutting out the circle, cut the circle into a spiral starting from the outside inwards. Now it’s time to roll the cardstock spiral into roses. To do that start rolling the paper from the outside in, keeping the rolled paper as tight as you can, until you reach the end of the spiral. You can now let it gently unroll a little bit until you have the rose look as you like it. Without touching the rose down, apply a small amount of glue to the end of the paper and attach it to the bottom of the rose to secure it. Repeat to make a lot of roses in the same way. After making the roses you can proceed to make complete the wreath. You can start by wrapping the wreath form with a wide red ribbon or even spray paint it red, so you can be sure that no white spots will show between the roses. Lay down the wreath form and using your hot glue gun, glue a rose anywhere on the wreath; that will be your starting point. Continue gluing one rose after another tightly to each other until you have covered all of the visible wreath form. It is true; you can’t go wrong with roses for Valentine’s Day. They are an all-time classic and it would be hard to find a woman that won’t appreciate a beautiful bouquet made out of fresh red roses as a Valentine’s Day token of appreciation. 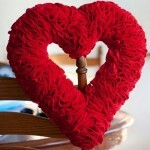 Valentine’s Day is the perfect opportunity to show your feelings to exceptional person in your life. There is an abundance of ideas for Valentine’s Day gifts but it always special to give something you have given thought and effort into. DIY items made with love, bouquets made out of a favorite flower type or personalized gifts are always the best way to go. 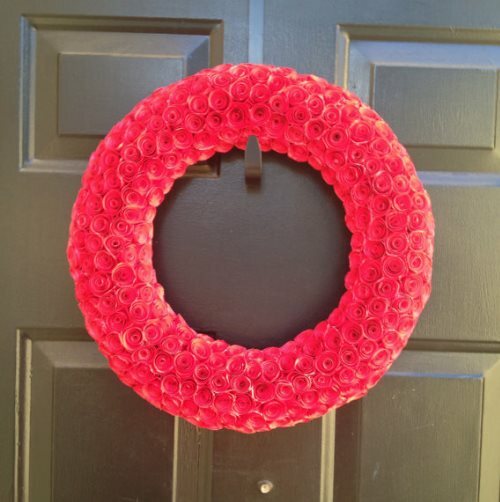 Wreaths are so pretty that you can make one for any occasion. 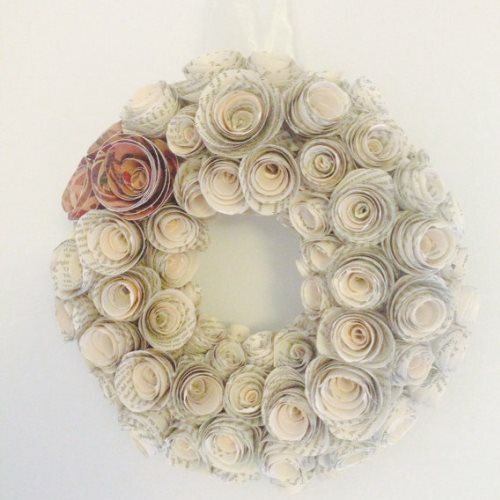 To add some sparkle to this paper craft wreath you can spray some diluted shimmer paint on the paper roses. 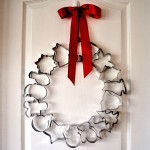 Also, using different colors of cardstock can make the wreath ideal for all year around décor. Most paper crafts are really easy and fairly quick to put together. Most of the time you will only need a few supplies like cardstock, glue and scissors to make them. 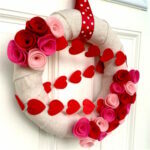 These Valentines Paper Craft Wreath are well worth the time that is needed to make them. 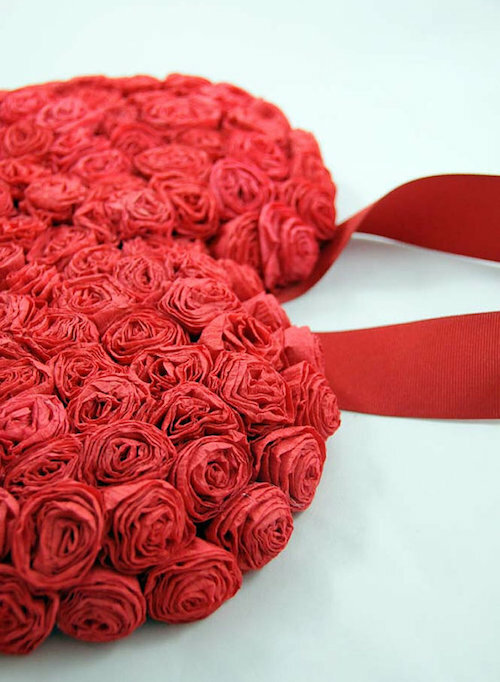 You can use different shades of red for an interesting result, as well as use completely other materials for making the roses, like pages from old books or music sheets, felt or burlap. Just follow the same steps as described above and you will be stunned by the result. 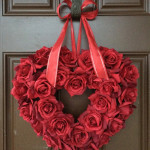 For more Valentine’s Wreaths search our Valentine category.